Have you ever wanted to learn how to decorate a cake!? 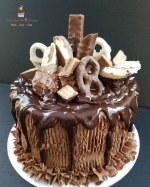 Come learn how to level, stack, fill and frost a two layer cake in this class taught by Joellen from Castle Rock Baking Company. You will be creating the cake shown and all supplies and tools will be provided to create your own masterpiece. Plus you'll be given a brag box to bring home your creation. Another added bonus- the instructor's cake will be used as a tasting cake at the end of the class! Yum! Due to space limitations we will be offering 12 cakes to decorate- registration is required. Participants aged 12 or older are welcome to register as an individual or come with a partner. Please keep in mind food allergies when signing up for this class- decorations and ingredients may contain nuts, etc.